Members of the Southern Illinois University Edwardsville School of Engineering’s Constructor’s Club used their building skills and knowledge to make a positive impact on families in need over spring break. Thirteen students partnered with Habitat for Humanity to volunteer their time in Walton County, Florida from March 8-15. 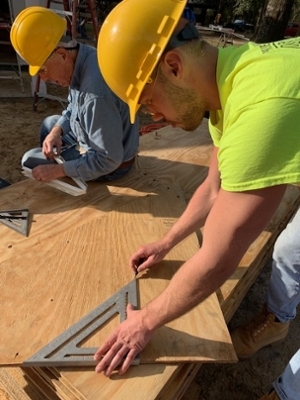 This marked the fifth consecutive year the SIUE Constructor’s Club has visited the area to build houses during the University’s spring break. While there, the students set trusses, laid decking, felted the roof, and hung siding, soffit and facia. They also attached hurricane clips and assisted with interior electrical and plumbing finishes. Participating students included Vahling, Elizabeth Green, of Morrison, Brittney Koter, of Chicago, Collin Jansen, of Green Creek, Austin Mattingly, of Marshall, Julia Michael, of Fairview Heights, Will Zerr, of St. Charles, Mo., Jakob Kunkel, of Rushville, Adam Sullivan, of Palmer, Michael Vester, of O’Fallon, Mo., Mathew Weber and Kyle Hardiek, of Teutopolis, and Chris Donovan, of Columbia. The SIUE Constructor’s Club has been regularly recognized for its community service contributions. It has received multiple leadership awards from SIUE’s Kimmel Student Involvement Center. It has also been recognized via the Associated General Contractors Outstanding Student Chapter Contest. 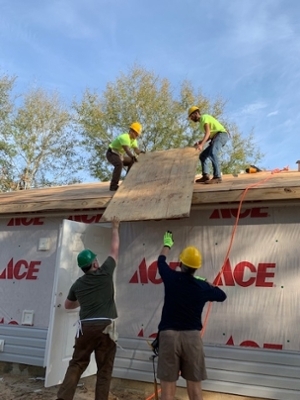 Photos: Members of the SIUE Constructor’s Club volunteered their time building houses in Florida during the University’s spring break. Pictured here are the SIUE volunteers, along with core volunteers from Habitat for Humanity and the homeowner. SIUE Constructor’s Club member Jakob Kunkel and a Habitat core volunteer hand a sheet of plywood to SIUE’s Adam Sullivan and Austin Mattingly. SIUE’s Chris Donovan meticulously measures a piece of plywood on the job site in Florida.